Summer is now officially here no matter which calendar you follow. Solar Summer (the lightest quarter of the year) began way back on 7th May. Meteorological Summer (the warmest three months) followed 1st June and now Astronomical Summer (between the Summer solstice and the Autumnal equinox) is underway as of 20th June. We’ve already experienced some Summer-like weather with heat and humidity in late May and early June but where are the thunderstorms? In this month’s Beyond the Forecast, I’ll explain what ingredients are necessary for thunderstorm development and why Summer boomers have been few and far between here in Maine thus far this year. How do thunderstorms form? In the simplest of terms, thunderstorms occur when warm air rises, cools, and condenses violently enough to cause heavy rain, thunder, lightning, and sometimes gusty winds, hail or even tornadoes. In meteorology, the name for thunderstorms is convection, which comes from the thermodynamic process that produces such storms. There are two main ingredients necessary for convective development: instability (the fuel) and some sort of trigger or spark to ignite the fuel. I use this analogy because convection is extremely violent. A typical, garden variety thunderstorm will release more energy than the atomic bomb dropped over Hiroshima in 1945. For severe thunderstorms or clusters of thunderstorms, the amount of energy released increases exponentially. To get such a violent explosion, you need some potent fuel and something to set it off. First let’s talk about the fuel. Fuel for thunderstorms is unstable air, which can be quantified through measuring CAPE (Convective Available Potential Energy). I won’t get into the nitty gritty details of how CAPE is calculated but it is basically measured by seeing how easily a parcel of air can rise through the atmosphere. Air can rise for many reasons but in terms of most convection, air rises because it is warmer than its surrounding environment. Warm air is less dense than cold air and so the relatively warmer air will always be less dense than the relatively colder air. That pocket, or parcel, of air becomes buoyant and will rise until it no longer can. You can see buoyancy everywhere from balloons in the air to bubbles in the sea. When air is buoyant in the atmosphere it rises, cools, and its water vapour condenses into clouds, and eventually, precipitation. This is how thunderstorms work at the most basic level. This process can only occur if air parcels start rising. This happens when the air near the surface warms, usually due to the sun while the air aloft remains cool. The more the lower levels heat up and the colder the upper levels remain, the more buoyant the air parcels become. 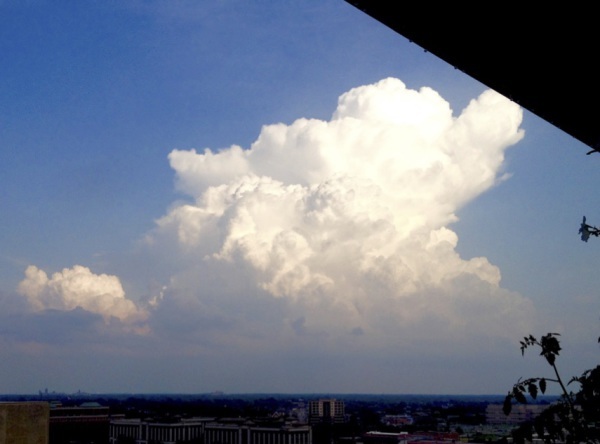 Increasingly buoyant air parcels will rise with increasing force until a thunderstorm is born. Check out the leftmost column of the graphic with the coloured bars to see what I mean. The colours represent the temperature of the atmosphere with red being the warmest and dark blue being the coldest. The y-axis is height. To get instability you must have a significant drop in temperature over a relatively short gain in altitude so as to maximise buoyancy. The rate at which the atmosphere cools with height is known as the lapse rate which is usually given in degrees celsius per km risen. To get significant convection (big thunderstorms), usually the atmosphere must cool at a rate of 8 or 9 degrees celsius per kilometer at least through the mid levels. Once you’re a good 5-6 km up, the lapse rate usually weakens as you’re into the cold air well above the earth’s surface. The lower and colder this layer is, the faster the air must cool with height to keep the surface temperature constant. To get a visual on this, imagine the leftmost column of that graphic with the blue (cold) layer closer to the ground. All the other layers would be compressed and the rising parcel would become even more buoyant. To sum it all up, an unstable atmosphere features cold temps aloft relatively close to the ground and warm/hot temps at the surface. The change in temperature with height creates buoyancy which lifts warm air from the surface upwards into the colder upper atmosphere. The other thing you need to get convection is moisture at the surface that can be transported upwards to cool, condense, and eventually return to the surface as rain or hail. 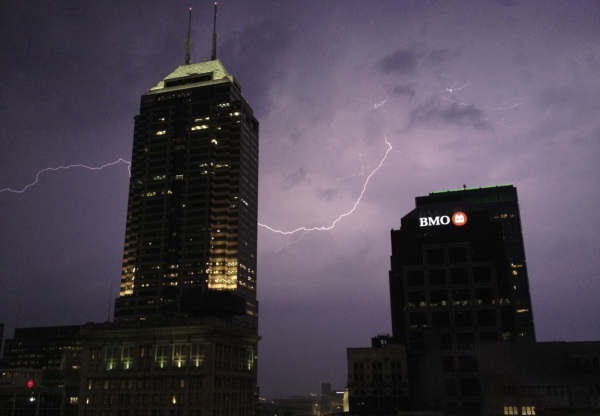 To fuel thunderstorms, you need not only instability, but moisture. We’ve now explored the chain of events and forces that create the violent rising currents (updrafts) within thunderstorms. However, for this process to work, there needs to be something to set it off. There needs to be some upper level energy to drive the cold temps aloft surfaceward. There needs to be some sort of surface disturbance, front, trough, etc. to get the warm air parcels rising in the first place. These are parts of the second ingredient for convection, the trigger. Many things can trigger convection depending on location. In Florida, clashing sea breeze fronts ignite storms. Differences in heating from mountains to valley can spark storms across the Desert Southwest. The difference in density between dry air and moist air are responsible for many of the classic Midwest twisters. Here in Maine, thunder is most often heard in association with cold fronts dropping south from Canada. The second graphic (below) depicts the typical setup in Maine shown as a cross section from somewhere west of the area to somewhere east (New York to Nova Scotia, for example). Most big storms in Maine feature a surface cold front with warm moist air ahead of it and cool dry air behind it. An upper level disturbance typically rotates around an upper low near Hudson Bay which pushes the upper level cold air closer to the surface, steepening lapse rates. As the sun heats up the atmosphere across the state and the cold front approaches, storms erupt and sweep east. ​Now we know how storms form. We know the ingredients necessary for storms to form and we know how those ingredients combine in Maine to create those classic Summer boomers. Now where are they and why haven’t we had any yet this year? Furthermore, why have they repeatedly evaporated just before reaching Portland? The short answer is that we’ve been missing one or more ingredients every day so far. When we have tons of heat and humidity, there’s no front or disturbance to provide the initial boost necessary to get air parcels rising. When there’s plenty of energy to get the air rising, there’s no high octane fuel in the form of heat and humidity to fuel any showers that might try to get going. Another common storm killing phenomenon here in Maine is known as a morning MCS or Mesoscale Convective System. These roll through in the morning hours with clouds, showers, and sometimes a rumble of thunder. They are leftover relics from the powerful storms that form over the Midwest and travel east. They act to prevent any heating of the surface for several hours, which can often reduce the amount of fuel for storms enough to prevent them from forming. Remember, if the surface is not significantly warmer than the upper levels of the atmosphere, there won’t be enough instability to ignite and sustain convection. But why have the storms that have formed evaporated or drastically weakened before they reached downtown Portland this year? To answer this, we turn back to the colourful bars graphic I used to describe instability. The centre and rightmost columns of that graphic give examples of stable air masses such as those we’ve seen in Maine so far this Summer. 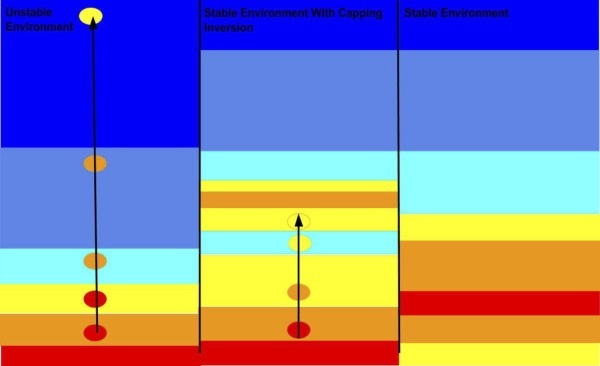 In the centre column, an air parcel begins to rise with shallow instability but is stopped by a warm layer aloft known as an inversion or ‘cap’. When the rising parcel reaches this layer, it stops rising because it is as cold as (or possibly even colder than) its surroundings. The rightmost column depicts what the atmosphere looks like when a sea breeze moves ashore. 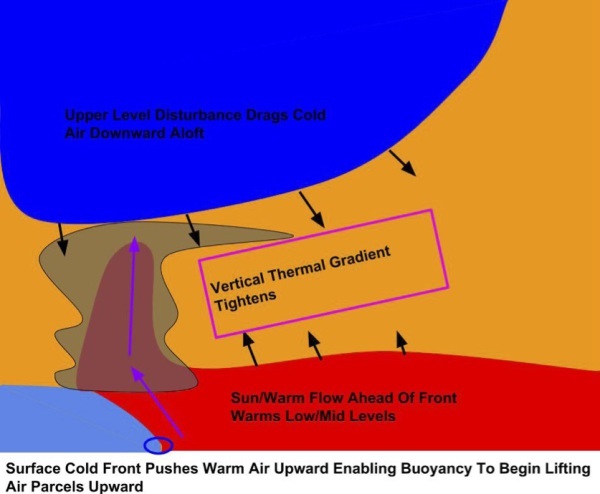 Cold air moves in at the surface while the mid levels of the atmosphere remain warm. No air rises because the air warms with height and thus it is impossible to have any buoyancy in that part of the atmosphere. By the time the air gets around to cooling with height, it is too high in the atmosphere to initiate convection most of the time, though sometimes elevated convection can form in situations like this. This phenomenon is most common in Maine during Nor’easters. That elevated convection brings us the thundersnow we all know and love though that’s a complex topic for another, chillier day. Enjoy the Summer everyone and remember buoyancy, lapse rates, CAPE, and cold air aloft the next time you hear thunder (after, of course, you get to a safe place from which to enjoy the storm).